Amazon's third quarter was marked by a return to big spending. Should investors be worried, or is this in shareholders' best interest? Amazon.com's (NASDAQ:AMZN) third quarter didn't quite live up to expectations, with earnings per share coming in at about 33% below analysts' average forecast. No-joke spending -- something Amazon investors are intimately familiar with -- was to blame. Despite shareholder familiarity with Amazon's heavyweight spending habits, Wall Street didn't welcome the sudden pullback in profit with open arms. Shares sold off about 5% after the quarterly report was released, as investors digested the implications of this higher-than-expected spending. Following a surprisingly robust second-quarter profit earlier this year, some investors may have thought the e-commerce giant's business had scaled to a point where profit margins could start getting fatter...permanently. So much for that. The big spending is back. And it's here to stay at least for another quarter, management predicts. Should investors be worried? Or are these the sort of investments that reinforce Amazon's competitive advantage and set the foundation for bigger profits down the road? To learn about Amazon's spending, and to see if it's really being allocated wisely, here's a look at what Amazon's CFO is saying about the company's aggressive cash outlays. Amazon's international e-commerce segment continues to lose money as the company focuses on an aggressive expansion in these newer markets -- and the loss worsened in Q3. While investors likely trust the company will eventually earn regular operating profits internationally, particularly after Amazon has pulled it off in North America after years of losses, some investors may view this worsening loss as a setback for the segment. International operating expenses were about 103% of international net sales in Amazon's most recent quarter, worse than just over 100% of net sales in the same quarter last year. Why the wider loss? Amazon is doing what it does best: investing aggressively. Amazon CFO Olsavsky listed fulfillment center support, digital content, and additional Prime benefits -- Fresh locations and Prime Now, in particular -- as some of the investments the company is making internationally. But one investment stood out above the rest, Olasavsky noted (via a Reuters transcript of the earnings call): "By far the biggest individual thing is the investment in India that we continue to make. Very excited about the initial reaction in India from both customers and also sellers." And Olasavsky went on to suggest investors should expect more of the same next quarter: "That is essentially the international margin guidance in Q4." Of course, Amazon's third-quarter operating expenses saw a surprising uptick not just internationally, but in North America, too. These investments suppressed overall third quarter operating results in the region, with the company reporting operating income of $255 million for the segment, down significantly from $1.5 billion in the quarter before it, or the second quarter of 2016. Further, Amazon expects higher operating expenses to continue to weigh on results. The company guided for fourth-quarter operating income anywhere between $0 and $1.25 billion, well below $2.2 billion of fourth-quarter operating income in 2015. "What you are seeing, essentially, in the second half of this year is a step-up investment, primarily around digital content and also the fulfillment center investment, but also things like Echo and Alexa, which we're adding a lot of resources to, India, and AWS as we add people there to support additional service rapid growth in that business." With the exception of AWS, or Amazon Web Services, all the spending Olsavsky mentioned in this quote is weighing on the company's North American operating results. Increased spending related to AWS will impact the company's important AWS segment, which accounts for a notable 63% of the company's operating profit. In other words, Amazon is spending heavily across its entire business. With all this spending taking place, some investors may wonder how Amazon management prioritizes its spending. Fortunately, the company exercises a very disciplined approach to capital allocation, evident by Amazon's ability to achieve outsized revenue growth over the past three years. 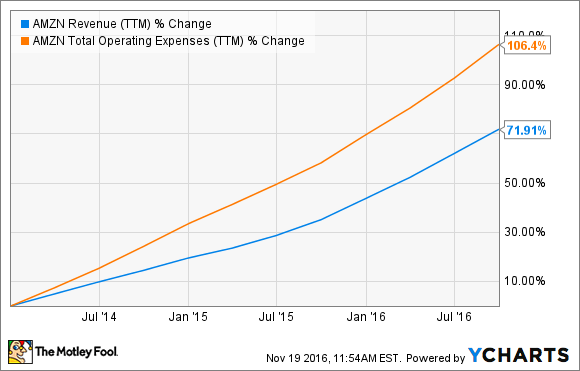 During this period, Amazon's traing-12-month revenue has soared 106% while its operating expenses increased a lesser 72%. In Olsavsky's words, here's Amazon's spending philosophy in a nutshell: "We will continue to invest in the business where we are seeing significant customer traction." As Olsavsky shows, there's good reason for Amazon's narrower margins today -- maybe even more so now than in the past after management witnessed, at least for a season, what it could do if it opted to relax its aggressive expansion a bit. The company generated an impressive $8.5 billion in free cash flow in the trailing 12 months. Percentage margins are not one of the things we are seeking to optimize. It's the absolute dollar-free cash flow per share that you want to maximize, and if you can do that by lowering margins, we would do that. Bigger spending for the company may mean lower margins today, but Amazon seems to believe the resulting customer traction will drive outsized free cash flow growth over the long haul. Ultimately, Amazon's spending only reinforces the company's sustainable competitive position. With its higher-than-expected operating expenses, Amazon isn't losing control of its operating income. Instead, it's relentlessly digging out a deeper and wider moat. And patient investors willing to stick around and reap the reward will probably be happy they did.